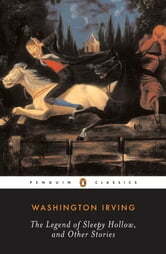 WhenWashington Irving first published this collection of essays, sketches, and tales—originally entitled The Sketch Book of Geoffrey Crayon, Gent.—readers greeted it with enthusiasm, and Irving emerged as America's first successful professional author. This volume includes "The Legend of Sleepy Hollow" and "Rip Van Winkle," two of America's most recognizable and loved works of fiction and displays Irving's ability to depict American landscapes and culture so vividly that readers feel themselves a part of them. And it is on the basis of these two classic tales that Irving is generally credited with inventing the short story as a distinct literary genre. Also included here are gently ironic pieces about life in England that reflect the author's interest in the traditions of the Old World and his longings for his home in the New.